LGBT History Project: Remember Anita Bryant? 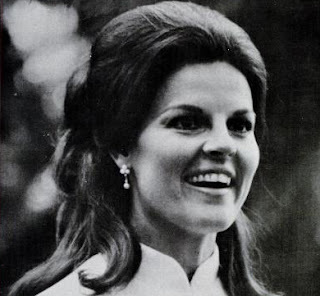 Anita Bryant was responsbile for possibly one of the most unpleasant anti-gay campaigns in the US in the late 1970s. In 1977, she led a, sadly, successful vote to repeal Miami-Dade's gay-rights ordinance. At the time she was a popular singer with appearances on TV. She appears to have been making very good money, and was at one point worth several million dollars. On 26 January this year, her husband of the time, Bob Green, was found dead at his home in Miami Beach, aged 80. This gives us an opportunity to reflect on the impact on them of Bryant's campaign. In 1980, Green came home one day to find Bryant was gone. The breakup caused many of her religious conservative folowers to abandon her, accusing her of not being a good role model. The ministry failed and the radio show never happened. Bryant divorced and later married Charlie Dry, a former astronaut test pilot, moving to Oklahoma. They have apparently had a series of bankruptcies and tax troubles. Bryant still performs occasional gospel concerts. It is 40 years ago this summer (1977-2017) when the notorious homophobic and anti-gay religious fanatic Anita Bryant started her campaign "Save Our Children" in Dade County, Florida. Famous for being a beauty queen, singer and Florida orange juice national spokesperson in the mid to late 70's, she took it upon herself to call all good and concerned Christians to fight legislation intended to protect homosexuals from discrimination. Her mission was to flush-out and get all suspected homosexual teachers fired from the county school system because she was convinced they were out to recruit and molest the children they were assigned to teach. As outrageous as that sounds today, back in 1977 gays were largely invisible and powerless and most Americans did not believe they even knew any homosexuals, no less wanted to see them protected in any way, shape or form ! The backlash was swift and she was soon discredited as a mean-spirited and hate-filled witch and eventually dropped as spokesperson for the orange juice industry. Gay now give the LGBT rights movement credit to her for making them mobilize, demand fair treatment and become more visible to Americans as people that were all around them and the only thing they were guilty of was not being heterosexual !